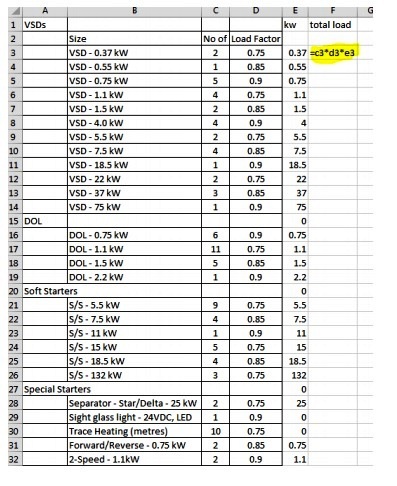 Today, we will start explaining Power Factor Correction Capacitors Sizing Calculations Steps in detail for the new designs as in the previous article “Power Factor Correction Capacitors Sizing Calculations – Part Five”, we only listed the Power Factor Correction Capacitors Sizing Calculations Steps. This step is used to make judgments about the best locations of power factor correction capacitors on the designed one-line diagram. 1- The one-line diagram must show the main structure of the electrical system from the utility interconnection up to at least the main motor control centers and larger panels which is called Main Low Tension Panels (MLTP). 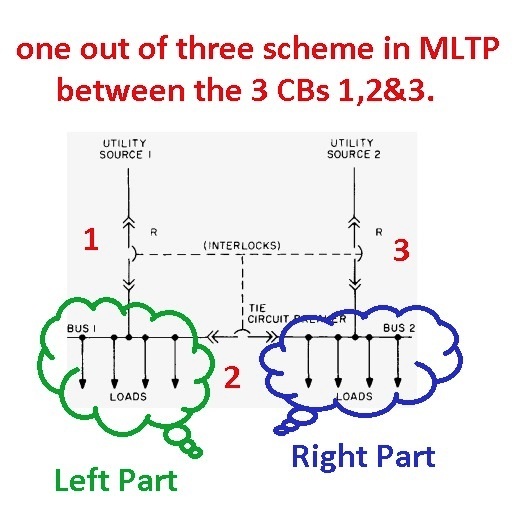 2- The feeding system of the MLTP panels usually 1 out of 3 which divide the MLTP to two parts (see Fig.1). 3- The lowest cost installations are generally fixed capacitors with few additional accessories such as automatic switches and harmonic filters. Therefore, the philosophy of this process is to start with a suitable fixed capacitor scheme and then modify it until the voltage and harmonic constraints are met. In many cases, it will be possible to meet the constraints without resorting to these additional items. 4- On the new designs always we recommend to put one capacitor bank on each part of the MLTP or MCC. 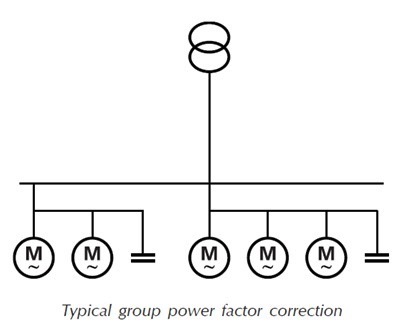 This means that the group compensation is usually the most appropriate type of compensation for the new designs (see Fig.2). 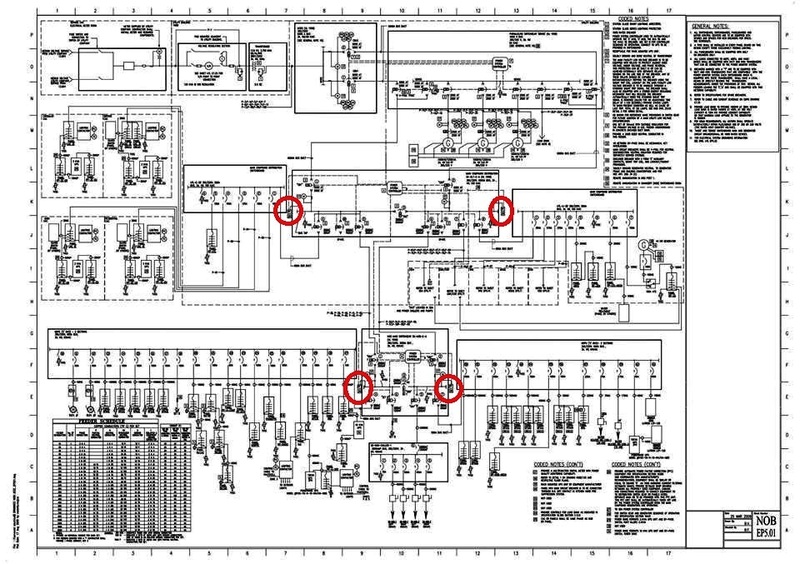 This will generally achieve a good capacitor scheme with respect to losses, although, it may be not optimal. 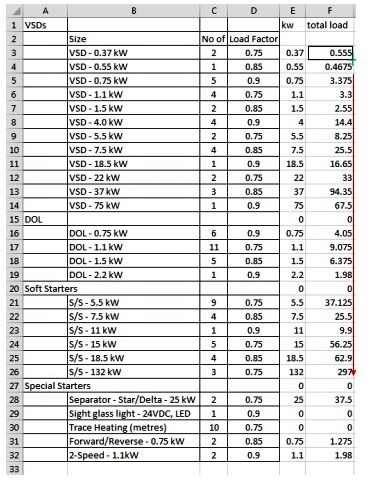 Please check the title "group compensation" in article "Power Factor Correction Capacitors Sizing Calculations – Part Five"
5- The rating of the capacitors is calculated using the designed PF (this will be considered as the old PF in calculations), the calculations of the capacitors rating will be explained in next articles. Below figure-3 shows an example of a one-line diagram where the group compensation is applied to each part of the MLTPs and marked with red circles. You can Supply the one-line diagram to suppliers/manufacturers to assist with the application to get an idea of the costs and the optimal distribution of the capacitor banks. 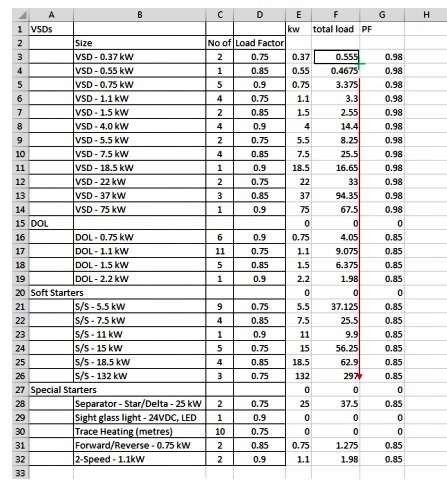 Step#7: Calculate the designed PF (uncorrected power factor of total load or old PF) from the equation PF = kw/kVA. To do this type in cell F3 the following equation ( =C3*D3*E3) and press “enter”. Then highlight cell, click onto bottom right corner and drag to bottom of column to obtain results for rest of “total load” column. To obtain the angle Φ, we obtain the cos-1 of cosΦ . In excel, ACOS = cos-1 so kW*tan(acos(PF)) in excel is equivalent to kW*tanΦ. In row 3 above, total kW = F3 and PF = G3. Therefore, kVAR of 0.37kW VSDs is =F3*TAN(ACOS(G3)). After typing =F3*tan(acos(G3)) into cell H3, press “enter”. Then highlight cell, click onto bottom right corner and drag to bottom of column as done previously. Highlight cell at bottom of TOTAL kW column and then click SAutoSum and enter. Then highlight cell at bottom of kVAr column and click SAutoSum and enter. 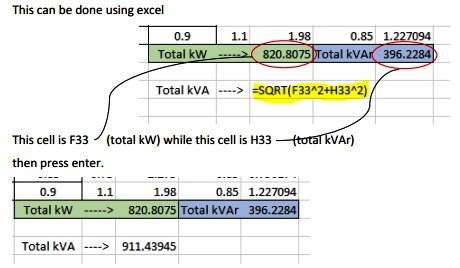 The cell F33 shows the (total kW) while the cell H33 shows the (total kVAR). Type in cell F35 the following equation (=SQRT(F33Ù2+H33Ù2)) then press enter to get the total KVA. 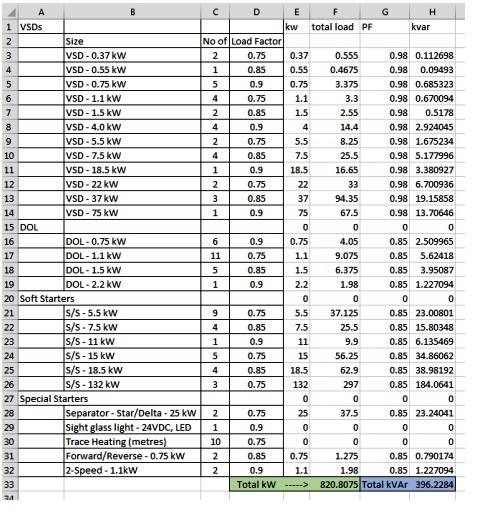 Step#7: Calculate the designed PF (uncorrected power factor of total load or old PF) from the equation PF = kW /kVA. 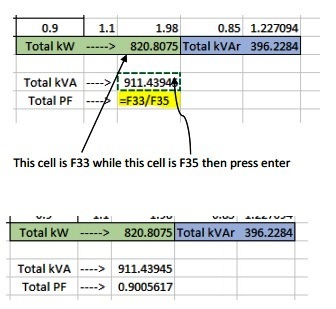 Type in cell F36 the following equation (=F33/F35) then press enter to get the total PF value which is the designed PF (uncorrected power factor of total load or old PF). 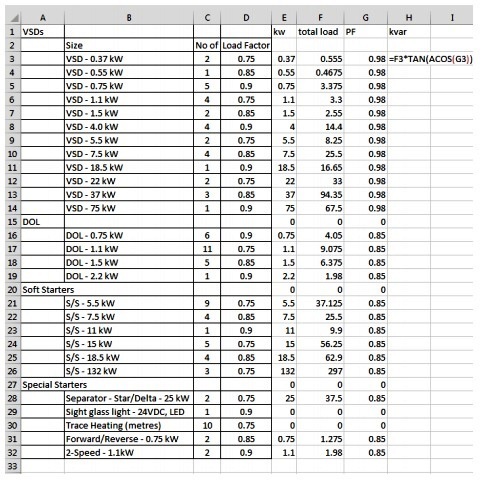 Hence, the designed PF (uncorrected power factor of total load or old PF) = 0.9005617 which will be used later in the calculation of capacitors rating. This step is used to check that if the Voltage Constraints Met or not. 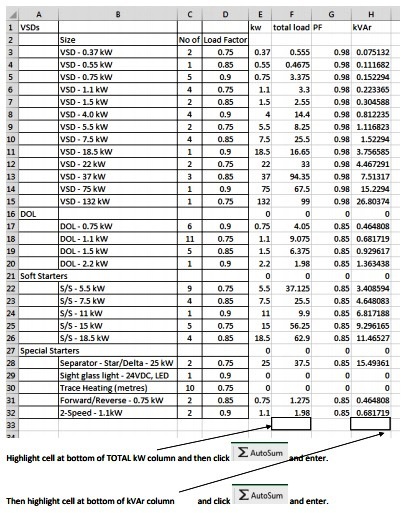 Please review the same step in article "Power Factor Correction Capacitors Sizing Calculations – Part Nine" for existing installations. 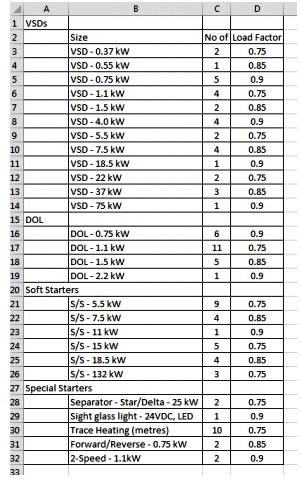 In the next article, we will start explaining different method of calculations for PF correction capacitor Ratings. Please, keep following.